You will be surprised by the luxury and spaciousness of this villa! This very fully furnished house is a great accommodation for a family or friends and is ideal for creating or celebrating special moments. You will find many options for relaxation and enjoyment in and around the house, including well-designed rooms, an extra kitchen with a bar adjoining the covered and heated veranda, a heated swimming pool with jet stream, a big lovely garden, a variety of terraces, a grill etc. 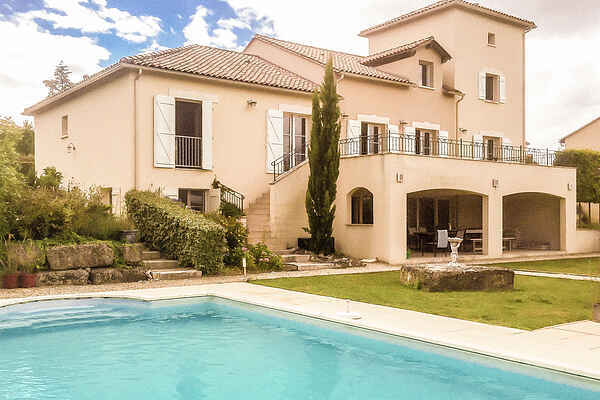 The house is situated directly on the La Preze golf course. The 18 holes are spread across a hilly landscape of copses, ponds and meadows. This part of the Charente is the ideal destination for golfers, hikers, cyclists and nature lovers. But culture lovers will be in their element as well. The old university town of Angoulême is about 25 minutes away, and Perigueux, Cognac and Limoges are about 60 minutes by car. The Charente is bordered by the Dordogne and the Limousin. It is one of the few areas in western Europe that have remained pristine and you can feel the wholesome tranquillity here. Since this is where cognac grapes are grown, the French government allows only very limited industry here, keeping the air fresh and unspoilt. In this hilly countryside, beautiful forests alternate with rolling green pastures where you can see animals grazing, including the famed limousine cattle.